The HM15 is an automatic stapling machine as bench-type version with one or two stapling heads for normal and loop staples and flat stapling with clinch. Professional and heavy duty automatic stapler, the Stago HM15 is designed for continuous stapling with a capacity of up to 17 mm with one or twin stapling heads. 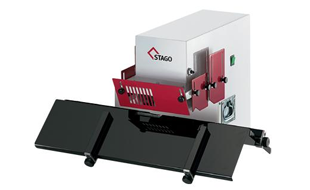 Functionality, precision and ease of use are at the foreground of all Stago Stapling Machines. Equipped with electrically secured protection (automatic machines) and easily loaded with staples from the front. Interested in the Stago HM15?